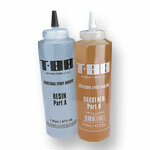 A high-performance, non-brittle, two-part epoxy adhesive designed to give superior results under adverse conditions. May be used without modifications in normally fitted joints. Cures in any thickness without shrinkage. 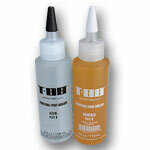 Bonds to most materials including wood, fiberglass, concrete, ceramics, glass, and leather. Also works well on oily and tropical woods such as teak. T-88 is clear amber and becomes virtually invisible when varnished. 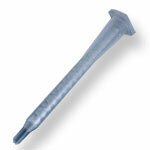 Exhibits outstanding adhesion and permanence on a wide variety of materials. 1.6 Oz. 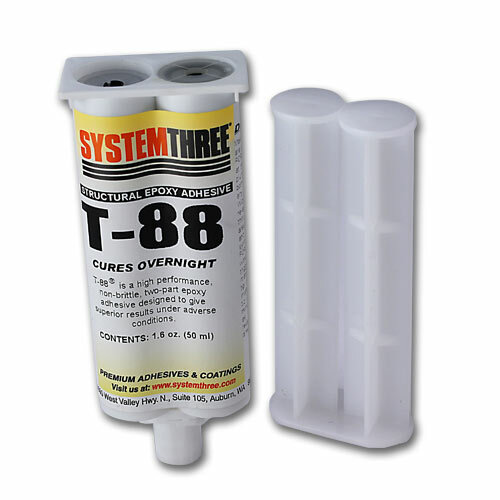 Syringe - T-88 in a syringe format that automatically dispenses equal parts resin and hardener with a push of the plunger. Make mixing automatic with the addition of the Syringe Applicator Mixing Tips (#52870). System Three Syringe Applicator Mixing Tips - 6 Pk.